Confidential Document Destruction of highly sensitive business materials is essential for organisations of all sizes. Choosing a secure document destruction company that you can rely on is a vital step towards a guaranteed secure, reliable, convenient and cost-effective document destruction service and records disposal. This is why you should only trust Metropolitan Shredding Service for all your document destruction and paper shredding requirements. A trusted and secure document shredding provider is a must! The number of privacy and information disposal laws has grown over the years, making it imperative for businesses to ensure records destruction and secure document disposal especially for files containing confidential information. Unauthorized access to sensitive information could greatly affect your business reputation so regular document destruction must be enforced only by a trusted records destruction and document shredding company. 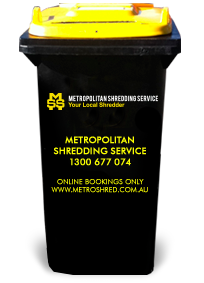 Metropolitan Shredding Service is the #1 paper shredding company in Australia. A member of the National Association for Information Destruction, Metropolitan Shredding Service provides document shredding services and record destruction to any company in Melbourne, Sydney, Brisbane, Adelaide, Canberra and Perth from small business up to large commercial, Government offices, Medical offices, Legal offices and International Corporate offices where a high level of security is required. At Metropolitan Shredding, confidential document destruction is our priority. Our approach to proper document destruction and secure shredding of confidential paper-based documents means greater peace of mind for you and your company.